Planning advocates nationwide are connecting with their elected officials this month ahead of midterms to highlight the important role planning plays in addressing communities' most daunting challenges, including housing affordability and availability. Great Places in America events are celebrating planning in communities across the county. 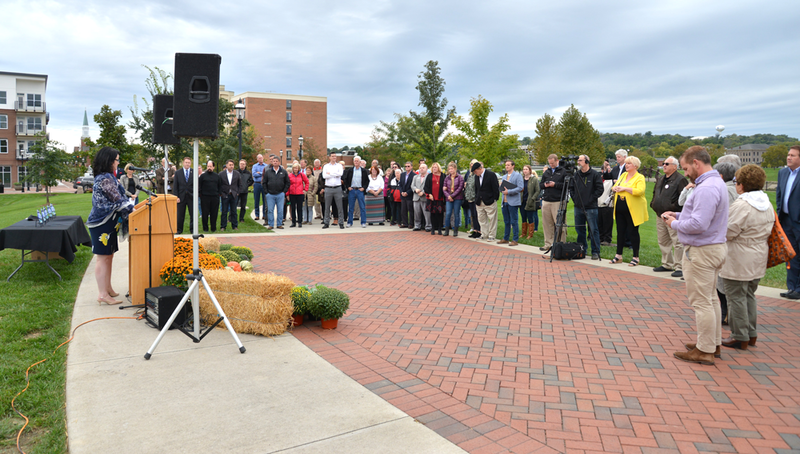 Community members, city staff, and elected officials gathering in Hamilton, Ohio, to celebrate the designation of RiversEdge at Marcum Park as a 2018 Great Place in America. Wendy Moeller, FAICP, giving welcoming remarks in Hamilton, Ohio. Photo courtesy City of Hamilton. Historic Downtown Georgetown, Texas, brought residents and city officials together to celebrate its historic district planning. 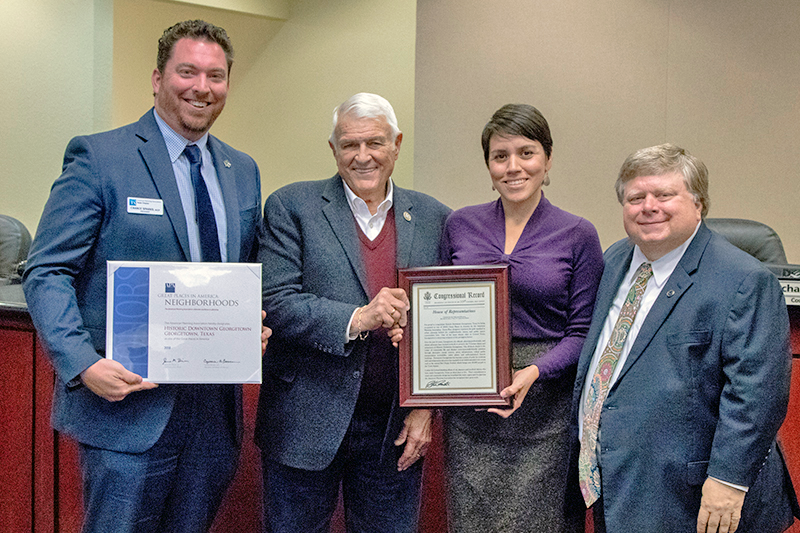 Historic Georgetown celebration: from left, Chance Sparks, AICP, president-elect Texas Chapter of APA; U.S. Rep. John Carter; Sofia Nelson, Georgetown planning director; and Mayor Dale Ross. Photo courtesy City of Georgetown Planning Department. The neighborhood of Ghent in Norfolk, Virginia, celebrated its designation along the Hague waterfront. Ghent celebration: U.S. Rep. Bobby Scott; Mike Spenser, president of the Ghent Neighborhood League; Mayor Kenny Alexander; Earl Anderson, AICP, president of APA’s Virginia Chapter; City Council Member Cortney Doyle; Vice Mayor Martin Thomas, Jr.; City Council Member Andria McClellan; and Acting Director of Development George Homewood, FAICP. Photo courtesy City of Norfolk Department of City Planning. State Representative Stephen Kulik celebrated the Great Place designation with the folks from the Village of Shelburne Falls, Massachusetts, showcasing the value of state-level engagement. 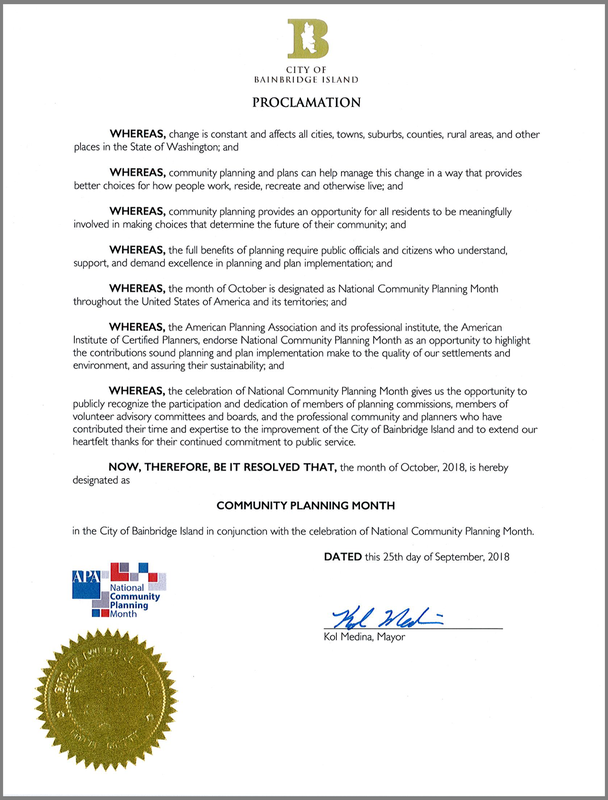 In Oregon, Washington County, Beaverton and Gresham have joined several other communities in celebrating National Community Planning Month. Washington County’s staff developed a month-long program of news releases and social media announcements through Facebook and Twitter to communicate how planning builds better communities. Kilgore, Texas, Mayor Ronnie Spradlin proclaimed October 2018 as Community Planning Month. To amplify planning even more, the City Council unanimously agreed to spend $112,750 to update its Comprehensive Plan, and $60,000 to assess the condition of Kilgore streets and sidewalks. Gov. 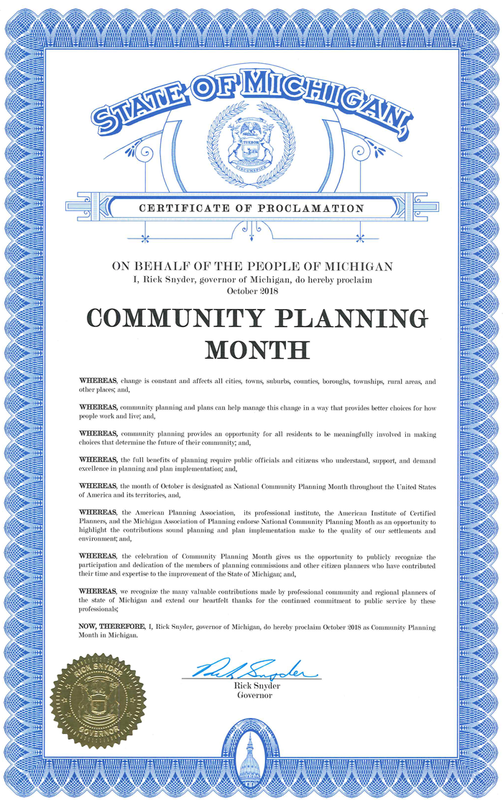 Rick Snyder proclaimed October 2018 as Community Planning Month for the State of Michigan. Gov. John Bel Edwards signed a proclamation declaring October 2018 as "Community Planning Month" throughout the state of Louisiana. The City of Johnston, Iowa, is recognizing October as NCPM through a reading of the proclamation during their City Council meeting with members of the Planning and Zoning Commission and Board of Adjustments in attendance. The City of Margate, Florida, kicked off celebrating Community Planning Month by presenting the Proclamation at City Commission meeting on September 26. The City of Bainbridge Island, Washington, Mayor Kol Medina signed a proclamation to make October 2018 Community Planning Month. The National Association of Counties is hosting a webinar to highlight the important role county planning plays in creating healthy, safe and vibrant counties. The webinar will address the high cost of housing, discuss the unique role that counties can play in responding to affordable housing challenges, and present best practices strategies. FEMA is promoting National Planning Month on its Hazard Mitigation Planning website, which includes a link to the Hazards Planning Center from their website. FEMA explores how housing as community infrastructure relates to resiliency and resiliency planning, specifically re-examining where and how we build. Tools provided by FEMA encourage further outreach by planners and local governments in hazard-prone areas. In honor of Planning Month, the Town of Clarkdale Town Council on October 9 adopted Sustainable Development Guidelines for multi-family, mixed-use, and commercial development, providing practical and innovative methods of conserving resources and preserving the environment. These guidelines are an impressive step in the direction towards a more resilient future and are exemplary of how advocating for planning shapes our communities. Oklahoma Sen. Jim Inhofe gave a fantastic shout out to Great Place in America Guthrie Historic District and their Great Places celebration event, in addition to National Community Planning Month, in his constituent press release. It is an honor to have the support from the Senator, and a wonderful promotional opportunity for the City of Guthrie. U.S. Rep. David Price from North Carolina used social media/twitter to showcase the great planning in his state. He highlights the importance of advocating for planning in order to secure federal funding for critical planning projects, such as Fayetteville Street redevelopment. Share how your community members and elected officials are celebrating National Community Planning Month on social media at #PlannMonth or send an email to ncpm@planning.org. Lowell, Massachusetts, celebrated on October 9 the designation of the Canalway Cultural District as a Great Place in America. APA Massachusetts Chapter President Angela Cleveland presented the designation certificate to Mayor William Samaras to honor the planning that created this Great Neighborhood. 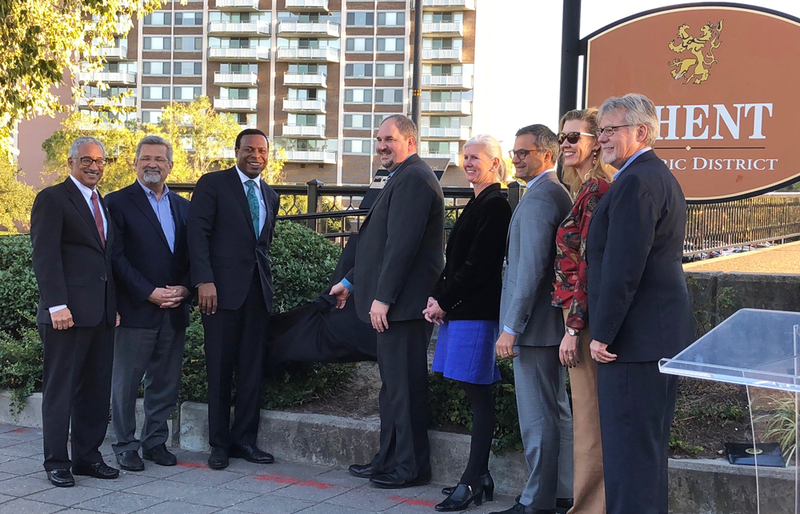 To celebrate National Community Planning Month and also their 2018 Great Places in America designation, State Rep. Rosa Gill supported the great planning in Raleigh, North Carolina, by attending the announcement celebration of Fayetteville Street as a Great Street in America. Speaking of Great Places, planners from across the country came to Washington, D.C., to meet with senators and representatives to tell their planning stories. Designees from all 15 Great Places participated in meetings with their elected officials' offices to discuss how planning made their Great Place possible. Top image: Planners Jackson Fox and Laurie Cummings, AICP, talk with Alaska Sen. Lisa Murkowski during Planners’ Day on Capitol Hill 2018, the final day of APA’s Policy and Advocacy Conference. APA photo by Pixelme Studio.